Molten lead, marzipan pigs, Freddie Frinton, the Pummerin, and Strauss. Not the answer to an obscure Trivial Pursuit question, but just some of the traditions celebrated at New Year in Vienna. Like just about everywhere, friends and families gather together on New Year’s Eve in Vienna (or Silvester as it’s known in German) to celebrate and think of all the new resolutions they won’t be keeping longer than a week. 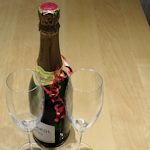 These New Years’ Eve festivities typically involve the exchange of small gifts, like chocolate coins and lucky charms. In the days leading up to New Year, Vienna fills with stands selling these charms, mostly as small plastic items or made of marzipan. For more artistic creations featuring these motifs, try the New Year markets. Other common “lucky” gifts are fish-shaped sponge finger biscuits and Brieflos instant lottery tickets. You open the latter right away to reveal a cash prize (or likely not). A common pastime at Silvester parties is to play with molten metal. (What could go wrong?). 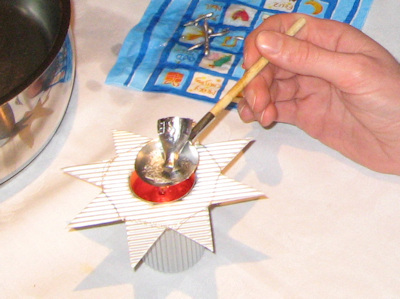 Traditionally, you hold a lump of lead on a specially-designed spoon over a candle until the lead melts. Then you pour the molten metal quickly into a bowl of water, where the lead hardens. Actually, the shape the lead takes predicts your future, which is the point of the exercise. There’s even a word for this form of divination: Molybdomancy. So, for example, a crown suggests financial success. As you might suspect, the shapes formed in the water are rarely clear. You have to use your imagination. Helpfully, this also means you can conveniently “see” shapes that suggest a rosy future. These days, the Bleigießen sets you can buy for New Year don’t actually contain lead at all. After all, it’s poisonous and lead-based sets are illegal. People use tin or wax instead. So don’t try this at home without using a certified set, and be sure to follow the instructions and warnings. Many countries have a TV programme intimately associated with a holiday. Love Actually and Christmas in the UK springs to mind. In Austria, it’s “Dinner for One” at New Year. And that’s not a translation. Every New Year’s Eve, the national broadcaster (ORF) plays the black and white 1963 sketch, usually in the hour before midnight. Freddie Frinton is butler James to May Warden’s Miss Sophie, who is celebrating her 90th birthday with a dinner. Since the traditional birthday guests have long since departed this world, James is forced to impersonate each so as not to disappoint his short-sighted employer. This involves consuming considerable amounts of alcohol, with the inevitable consequences. All this happens in English, though the sketch has a German introduction. A phrase from the show (“Same procedure as every year”) has even entered the German vernacular. Austria is not alone in this tradition, but one country where the sketch is rarely played is…the UK. I’m English and had never heard of it until I moved to Vienna. The countdown to the New Year in Austria is conducted by the curiously-named Pummerin. That’s not some strange position held by a wizened old timekeeper, but the huge 20-tonne bell located in the north tower of St Stephen’s cathedral. During the year, you can actually climb the tower and get up close to the bell. At midnight, the fireworks and crackers that have peppered the whole evening go off in earnest. Everywhere. The entire city becomes one giant firework display as people launch rockets with varying degrees of legality from balconies, parks, pavements, and apartment windows. It’s raucous and colourful and continues for a good half an hour or more. The smoke and smell hang over the city for hours after. It’s a bit of double-edged sword, though. We like to sit on our balcony and watch the display across to the hills in the west. On a clear night, it’s quite fabulous. At the same time, it’s all very loud. Many people begin well before midnight and not everyone is considerate about where they let off their bangers and rockets. Once the echoes of the Pummerin die away, TV and radio switch to Johann Strauss’s Blue Danube waltz. Those not fiddling with a firework fuse then grab a partner and dance in the New Year. Afterwards, all that remains to do is drink a glass of champagne or sparkling wine, nibble at your marzipan pig, and try not to think about all the clearing up.